Have a '10-Current Ford Mustang Shelby GT500 with factory stripes and need them for the BMC Mamba Hood? This kit will work! This kit fits the BMC Black Mamba Hood as shown and noted in the associated Parts List. 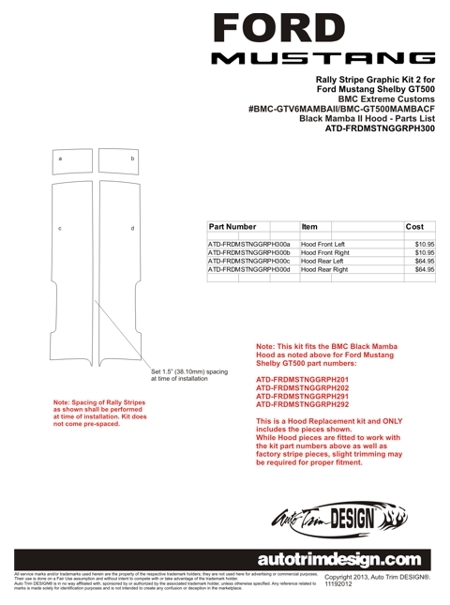 While Hood pieces are fitted to work with kit part number(s) specified in the Parts List as well as factory stripe pieces, slight trimming may be required for proper fitment. OEM vinyl colors and colors we offer may not match. Thus, we suggest color verification by ordering Color Samples prior to ordering (returns not allowed on Custom items such as this kit).